Once constructed, we needed a way to test the cytoplasm and periplasmic stress promoters in order to characterize them. We did this in three different ways. First, it was necessary to identify proteins that are known successful folders and known non-folders in E. coli. Maltose binding protein was selected for this purpose. Wild type maltose binding protein (MalE) is a transporter protein that is shuttled to the periplasmic space of E.coli and known to fold extremely well there. We chose a mutant form of maltose binding protein, MalE31, that does not fold in the periplasm due to two amino acid substitutions in positions 33 and 34. In addition to this periplasmic mutant, another mutant form of MalE was found, with the signal sequence required for transport to the periplasmic space deleted. The MalEΔSS folds extremely well in the cytoplasm regardless of the deletion. MalE31 with its signal sequence removed is a non folder in the cytoplasm. Thus, we have four proteins covering folding and non-folding in both the periplasm and the cytoplasm. The wild type MalE as well as the mutant versions were received from the Betton lab in France. These parts were Biobricked, but prior to testing the selected stress reporter circuits with these parts, it was necessary to test these MalE variations to ensure that they were functional and matched literature data. To do this, we transformed them into strains of cells containing cpxR and degP promoters upstream of a lacZ rpeorter (Raivio labs). We would expect malE31, if it misfolded, to activate the cpxR and degP stress promoters, thus providing a blue output from lacZ. MalE, on the other hand, is expected to fold properly, thus not activating these promoters, and produce any lacZ activity. These assays allowed us to conclude that MalE and MalE31 work the way that we expected them to. See results on our characterization page. Once malE and malE31 were shown to be functional, we then used them to test out the stress promoters. We did this by making competent cells containing our reporter circuits. We then transformed in inducible constructs containing our MalE and mutant MalE proteins. Fluorescent output was measured from these assays and the results can be seen on our characterization page. NlpE is an outer membrane lipoprotein that literature has shown to activate the Cpx pathway. We transformed expression constructs for this protein (obtained from Dr. Tracy Raivio's lab) into Top10 competent cells containing our CpxR reporter and looked for fluorescent output. Results for this experiment can be viewed on our characterization page. One of the proteins that are used to characterize Cpx system in the literature is new lipoprotein E (NlpE). NlpE is present on the outer membrane of E. coli membrane. NlpE is hypothesized to be involved in cellular adhesion and copper homeostasis in the cell (Otto and Silhavy, 2001). NlpE has an N and an identical C terminus motif which consists of cystine-X-X-cystine (CXXC) (Hirano et al, 2007). NlpE is an efficient control for the CpxP, DegP and CpxR systems that are being built for the periplasmic stress detection system due to the sensitivity of the Cpx regulon to NlpE(Price and Raivio, 2007). NlpE induces the Cpx operon in E coli at a much higher rate compared to other lipoproteins present in the E. coli. 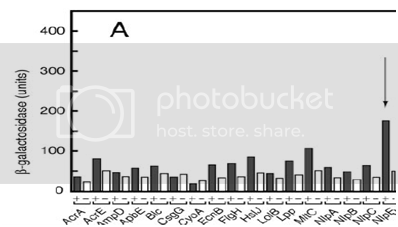 For example: NlpA and NlpB are proteins similar to NlpE but have significantly different outputs when they are introduced in a cell with DegP promoter with a LacZ protein coding region fusion (Miyadai et al, 2004) shown in figure 1. Finally we tested the CpxR promoter activity in the presence of varying temperature conditions. Literature data has shown that the Cpx pathway is also activated due to heat stresses. To establish a baseline that could be used to determine whether heat misfolded protein was activating the pathway, we exposed cells containing the CpxR promoter to heat stresses of 30°C, 37 °C, 42 °C, and 47 °C. The results can be seen on our characterization page under Experiment 3. Hirano, Y., Hossain, M. M., Takeda, K., Tokuda, H., & Miki, K. (2007). Structural studies of the cpx pathway activator NlpE on the outer membrane of escherichia coli. Structure (London, England : 1993), 15(8), 963-976. Miyadai, H., Tanaka-Masuda, K., Matsuyama, S., & Tokuda, H. (2004). Effects of lipoprotein overproduction on the induction of DegP (HtrA) involved in quality control in the escherichia coli periplasm. The Journal of Biological Chemistry, 279(38), 39807-39813.